Dr Niraj Lal is a Visiting Fellow at the ANU Centre for Sustainable Energy Systems. His interests are in nanophotonics for solar cell applications and science communication. In 2012 Niraj graduated as a Gates Scholar with a PhD in physics from the Cavendish Laboratory, University of Cambridge. Prior to his PhD, Niraj worked as a bicycle courier in Perth and a travelling science presenter to primary school kids across regional WA with Scitech. 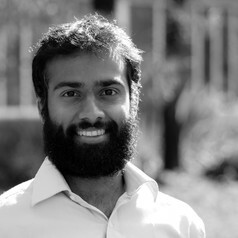 Niraj graduated with a BSc in physics from the Distinguished Scholar Program at the ANU in 2007, winning the Angus Nicholson Honours Scholarship for passion and excellence in Science. He has appeared on BBC's Naked Scientists Radio, ABC Radio National Science Show and has written two children's book about science.